Recombinant fragment, corresponding to amino acids 402-894 of Human SMC1. Our Abpromise guarantee covers the use of ab16147 in the following tested applications. WB: Use at a concentration of 1 - 5 µg/ml. Detects a band of approximately 166 kDa (predicted molecular weight: 143 kDa). 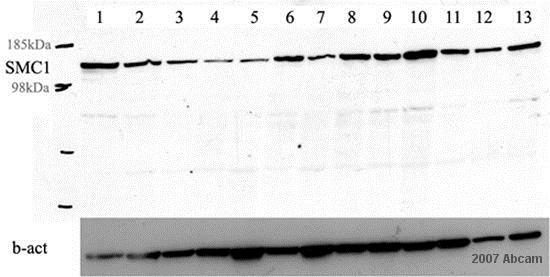 Several customers have reported the antibody not working well in IHC. We have also had reports that this antibody does not work in ICC/IF on HeLa cells. ab16147 has not yet been referenced specifically in any publications. Publishing research using ab16147? Please let us know so that we can cite the reference in this datasheet.